Public Event honored Carole Arpin at her Whitemarsh Island home. (SAVANNAH, GA) In recognition of Alzheimer’s Awareness Month, a “Marsh Harbor High Tide Moonlight Mingle” raised a grand total of $3,426 to benefit the Alzheimer’s Association, Georgia Chapter. Featuring music, dancing, food and drink, the event was held at the Whitemarsh Island home of Donald and Carole Arpin. The waterfront estate is located on Turner’s Creek in the Marsh Harbor community. Festivities included an appearance by Tommy Arpin to honor his mother, Carole, who has been diagnosed with Alzheimer’s. 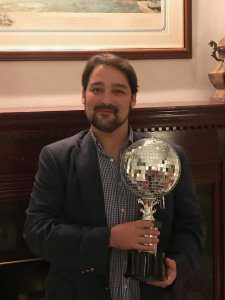 Arpin is a participant in the 2018 Dancing Stars of Coastal Georgia and offered a sneak peek of the dance he will perform at the annual Alzheimer’s fundraiser in May. Last year, Dancing Stars events generated more than $2.6 million across the state, including nearly $400,000 at the Savannah event. Guests at Moonlight Mingle were encouraged to support the Alzheimer’s Association with a donation in honor of Carole Arpin. Music was provided by the Marshall Brothers Band featuring Stewart Marshall (Stewart & Winfield, Junkyard Angel) as one of the Low Country Rock five-piece band’s three vocalists and guitarists. More than five million Americans are living with Alzheimer’s disease, and, every 66 seconds, someone is diagnosed with the disease. Two-thirds of them are women. It is the only disease among the top 10 causes of death in the United States that cannot be prevented, cured or even slowed. The fundraiser also showcased the Arpin home, which is listed for sale. The brick home with four bedrooms and three full and three half bathrooms is located on Turner’s Creek at 8 Marsh Harbor Drive. It features sweeping views of the marsh and river, along with a library, two fireplaces, a stately dining room, gourmet kitchen, split floor plan and exquisite custom woodwork.